I love, love, love Fattoush, a Middle Eastern salad that explodes with flavor. I was first introduced to it at a Lebanese restaurant in Ghana. I lived in Ghana, in West Africa, for years and it has some incredible restaurants. Fattoush is served with warm pita, usually crispy from the oven. If you have leftover pita from a party or pita that’s about to go stale, you should make Fattoush. Fresh herbs, like parsley, mint, basil, are key to this salad. I pack a lot of parsley in mine and often use cilantro, too. The vinaigrette is simple, lots of lemon and olive oil. If you love lemon, add the lemon zest, too. I hit mine with a general dose of black pepper and garlic salt and load on the green onions. The concept of the warm pita was my inspiration for this flatbread. To transform the salad into a main course, I added rotisserie chicken and then piled it all atop of whole wheat flatbread. I made my own flatbread, but you could use Naan or pizza dough or pitas instead. If you’re looking for a HEALTHY, delicious dinner, you’ve found it. It’s so light and flavorful. It’s the perfect summer dish. For the dressing, whisk ingredients together. Salt to taste and set aside. Bake flatbread according to directions. You want the salad to rest for 5-10 minutes before you add it to the flatbread but you also want the flatbread to be warm, so read the instructions before you make the salad so you time it right. Thinly slice the lettuce and green onions and place in a large bowl. Chop the parsley, cilantro or mint, cucumber, chicken, slice tomatoes and add to bowl. Pour salad dressing over salad and add a lot of black pepper and garlic salt. Taste as you go so you don’t oversalt. Allow it to rest 5-10 minutes. When pita is ready, top it with the salad and serve. Stir ingredients together in a large bowl. Drizzle olive oil over the dough, cover the bowl with a clean towel and place on the oven to rise for 6 hours. Turn the oven on to 200 degrees or more to help it rise. When it’s time to cook, preheat oven to 450 and place baking sheet in the oven to heat. Split the dough in half. Coat your hands with flour and work the dough into a ball (you may need more flour). Sprinkle corn meal and flour on a flat surface. Start working the dough in your hands, pinching it to spread it out. Then place on the floured surface and spread with your fingers until you have a piece of flatbread. When oven is ready, remove the baking sheet, sprinkle it with cornmeal to keep the dough from sticking, and bake 10-13 minutes, until crisp. Top with fattoush and serve immediately. 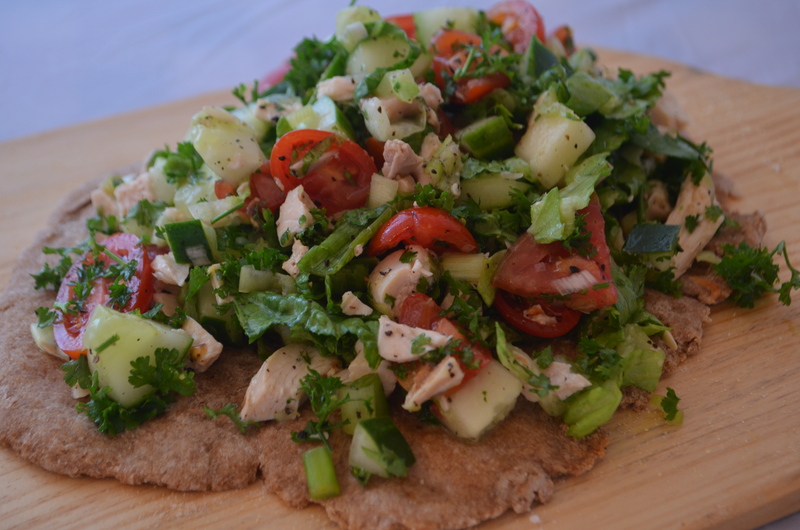 This entry was posted in Healthy Recipes, Main Courses, Salad and tagged chicken, dinner, easy, fattoush, flatbread, healthy, herbs, lemon, lettuce, lunch, middle east, olive oil, parsley, pita, quick, rotisserie chicken, salad on August 6, 2015 by Juliana Goodwin.